Like many others, I was very surprised to see motion controls take up such a large portion of Nintendo’s Switch presentation earlier this year. To be sure, I never thought the company would be entirely done with them — after all, they’re extremely useful for aiming in titles like Splatoon and The Legend of Zelda: Breath of the Wild. But as for going all-in on pure motion control titles? Yeah, I have to admit I didn’t think I’d see that again. And even though I’m not a huge fan of motion controls in general, I can be extremely enthusiastic about them in the right context. Skyward Sword‘s take on them enamored me the whole way through, and I have plenty of affection for Atlus’s Trauma series. So while 1-2 Switch may have shown the more disappointing, gimmicky side of motion control gaming, a hands-on experience at PAX East with upcoming Switch title ARMS made me feel a lot more optimistic about the Joy-Cons returning us to the Days of Waggle. …I’m just kidding about that whole Days of Waggle thing, of course. Everyone who’s played motion control games knows that they’re nearly always at their best when actual input is recognized — rather than the impassioned flailing we often saw in the early Wii era. 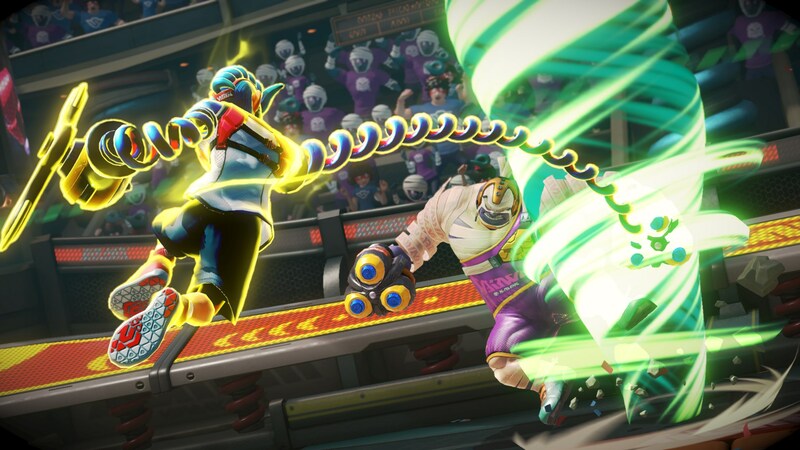 No, waggling will bring you swift and embarrassing failure in ARMS; though this doesn’t have anywhere near the precision of a fighting game, anticipating the moves of your opponent and employing an appropriate strategy is the way to achieve victory. Some people compared this game to Punch-Out!! early on, and I think that’s a fairly accurate comparison — only the tells can be a lot more subtle here, and the reaction time required a lot faster. Oh yeah, and of course, there’s that rather unusual motion control setup. So far, between 1-2 Switch and ARMS, I think I’ve already had to hold the Joy-Cons in more bizarre ways than I ever did with a Wii Remote and Nunchuk (but then again, I never played stuff like WarioWare: Smooth Moves). 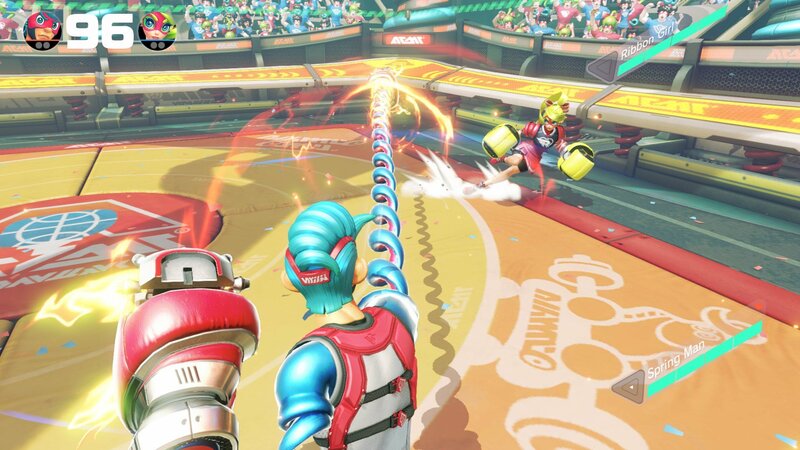 In ARMS, you’ve got to turn the controllers inward so the slide-on side is facing the TV/tablet and the L/R buttons are facing you. If that doesn’t sound strange enough, you control your fighter tank-style by tilting the Joy-Con in various directions as if the controllers themselves are actual joysticks. 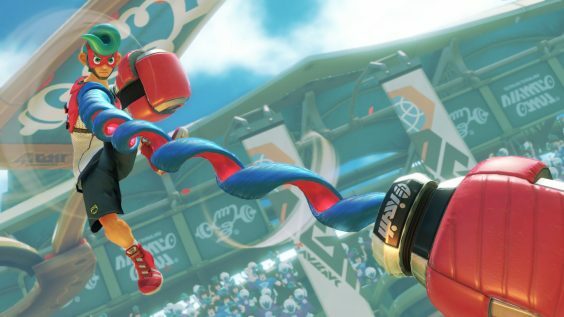 To block, you turn the controllers inward on their sides so the L/R buttons are facing each other; to extend your long arms for a punch, you jab outward with one controller and twist it to change the trajectory of your fist; and to grab your opponent, you jab both controllers out at the same time. All characters also build up a sort of super-meter that, when triggered with ZR, allows you to send out a flurry of fists by pumping the controllers like a madman. This nontraditional control scheme might sound like it could take some getting used to, but within a few minutes of standing at the Nintendo booth, I felt like I had pretty much gotten the hang of it. That’s a huge credit to the designers, and it seems like they’ve succeeded in their goal of creating something easy to pick up and play. Now, whether or not casual players will be able to get used to it as quickly or easily as I did is a different story entirely, but ultimately, it’s a lot more intuitive than I ever expected. 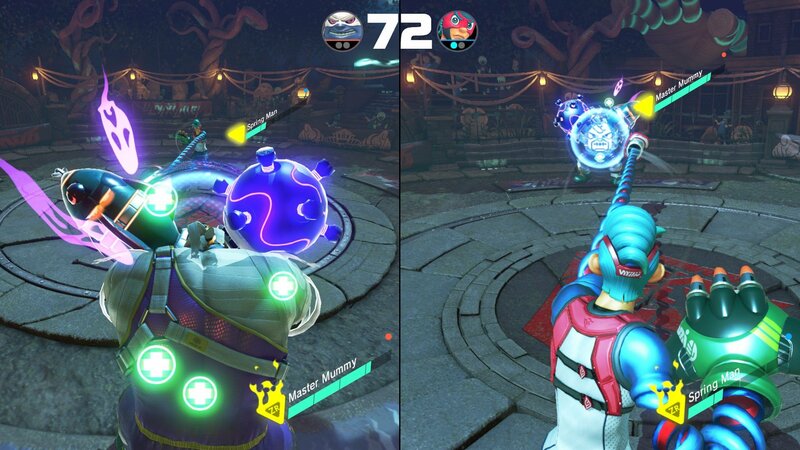 The two battles I participated were plenty of fun, too, and that’s what really matters. The feeling of twisting your arm so your onscreen character just manages to sock the other in the face before they dodge away is viscerally satisfying, and the range of different fists (and of course, the characters that use them) adds some good variety to the mix. 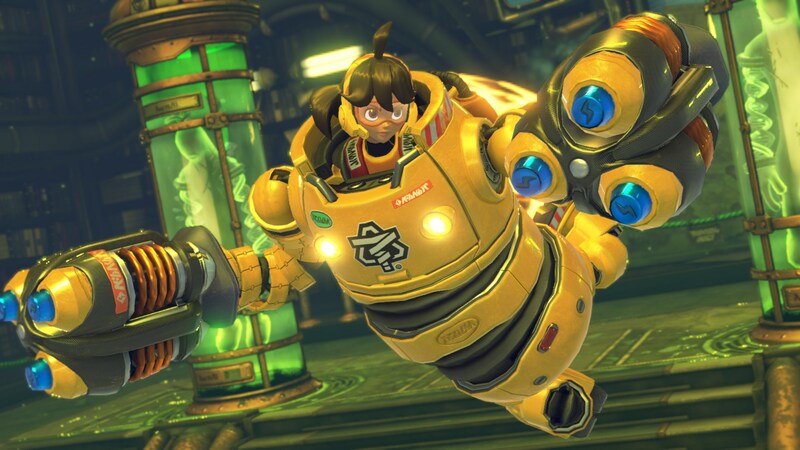 I suppose my only concern at this point is whether or not ARMS will be able to maintain long-term appeal. As one of the most prominent first-party titles on Switch owners’ radars, I’m a bit concerned about the goals and expectations for this game; as of right now, it’s available for pre-order on Amazon as a full-priced retail title. 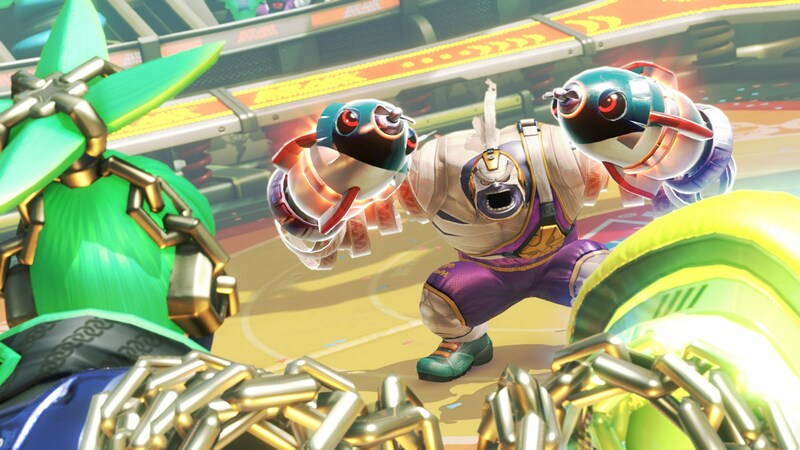 That’s all well and good in theory, but what we’ve seen of ARMS so far seems like a relatively simple 1-on-1 arcade fighter — one without the depth of a competitive fighting game, but also one that might be just a bit too complex or expensive for the casual consumer. 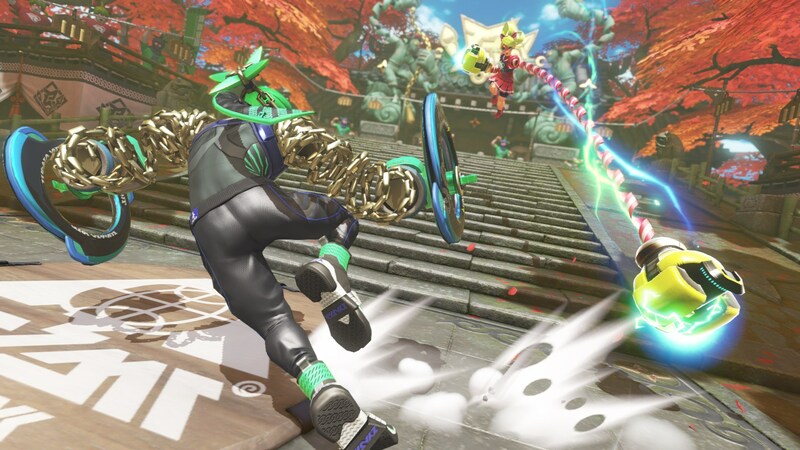 I’m eager to see, then, how Nintendo plans to both draw people in and keep their attention; whether that’s a huge roster of fighters and arenas, or a number of different wacky party modes, I’m down for it — it’s just that as-is, I have a rather difficult time picturing people sitting down to play it for more than a half hour or so at a time. In the end, though, I’m still pleased with how fun and intuitive the experience I had was. And just as I asserted in my review of the new Zelda, I couldn’t be happier to see Nintendo trying new things — no matter how weird they are. 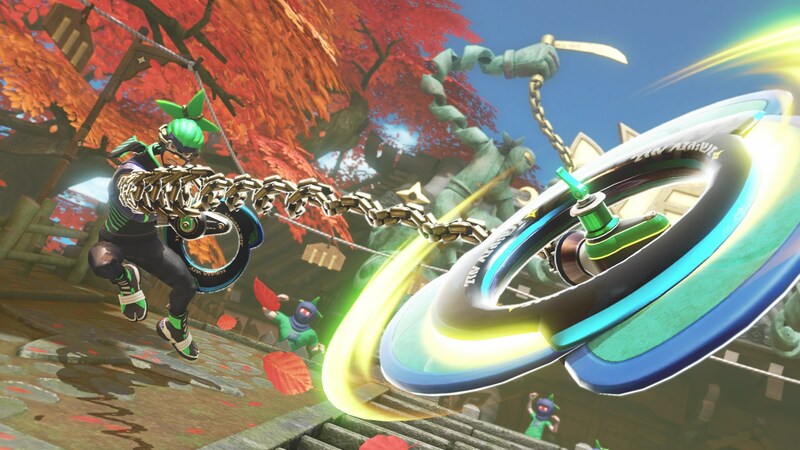 Fans of motion control gaming who were sad to see it go, along with Switch owners looking for a fun and simple arcade experience, should keep their eyes on ARMS.